as everyone knows ohio is considered one of the key states in the upcoming presidential election; as such we have been subjected to more than our share of targeted ads, phone calls, and door-to-door canvassing. being the focus on all this activity can be overwhelming; however, when some of this attention comes from an eclectic group of talented musicians there are moments when being the focus of so much attention isn't so bad and in fact is downright invigorating and joyful! 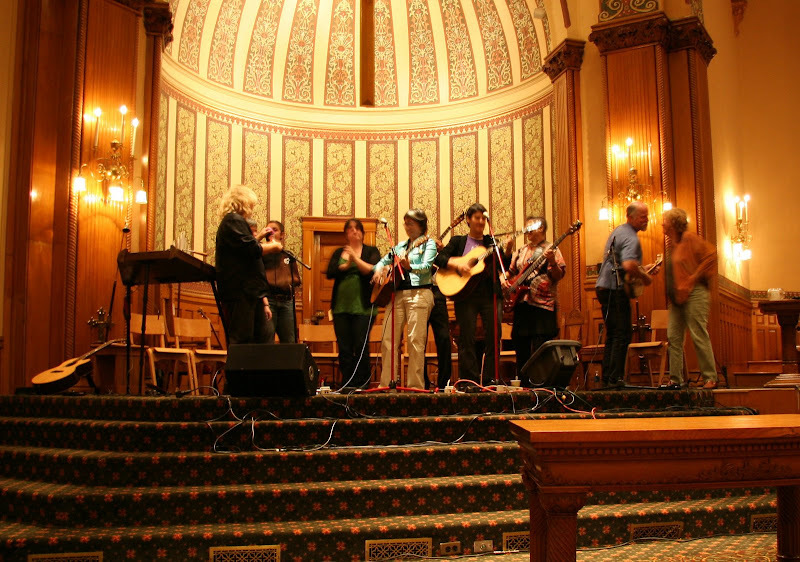 last night a very joyful noise was being raised at pilgrim church in tremont. 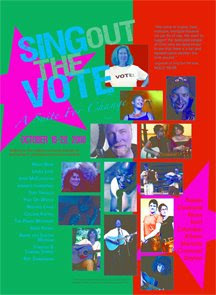 holly near and eighteen other singer-songwriters are conducting a whirlwind 11-day tour in nine ohio cities to encourage early voting and get out the vote! not all of the artists will be in every city - but every stop will feature holly near. the tour began on saturday in toledo and will end on october 28th in dayton. a visit to holly's website provides information on the tour and who will be playing at each stop. 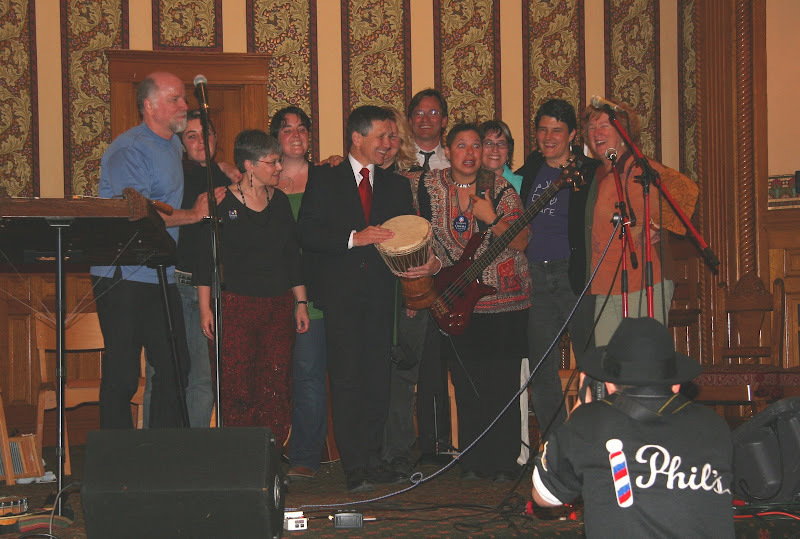 halfway through the concert, john mccutcheon announced that there was a special guest in the audience and welcomed dennis kucinich to the stage. dennis spoke for a few moments - reinforcing the evening's message of encouraging folks to vote early and extending a thanks from all of the audience to the musicians for taking the time to help ohio at this critical time in our country's history. today's number of the day is 14 - 14 days to the election of 2008! Wow! What a line up! Do you remember all those other wimmin singer/songwriters of the 1970s?? They did a piece on one of the morning shows about a family (for Obama) living in the battleground state of Virginia, and all the phone calls, mailings, ads, etc. that come pouring in every whichway. heard one of those horrible robo calls on youtube. The price one pays for free speech is pretty scary sometimes. Much prefere free speech in song, like these folks here. It's good to see how involved people are getting - I've never seen as much voting PR and pressure ever before in a US election. Goes to show how strongly people feel and the critical nature of this particular election in determining the US's future. Nice to continue hearing about long lines to Vote early. Not sure if I'll be able to sleep on Nov 4th. Haven't hear JM in years. Glad to see he's still around and Holly Near also. I agree with Coffee. It will be a long, long night. I volunteered to be a poll worker today! tut - it was a great line up!! I remember so fondly the first time I went to a holly near concert - 1982 outside new haven. those where the years I went to lots of wimmin concerts! I hear va may be going blue!! av - this is probably the most important election of my lifetime! we have to undo the horror of the last 8 yrs and put the u.s. back on a course of respect and making and implementing policies that take care of the most vulnerable people, the earth, etc... instead of taking care of the rich, corporations, and those that feel that might makes right! coffee - it's tense here. but all is well. I don't think any of us will be sleeping nov 4 (or 3rd) I have a date to vote early - on monday - there's a big push to do so....and considering the last election's problems in ohio, makes sense! john's voice was as pure as ever and what an instrumentalist!! he had a song about joe the plumber that I hope will get to youtube! it was a stitch done in a traditional irish fashion. megan - excellent!! I would love to work the polls but tuedays now is the only day I have kids at my house - I don't know if ms t and lil b will be interested! but maybe we will walk far from the polling place and I'll have them hold signs to saying think of the future - vote obama! I have to keep reminding folks that shortly after the polls close in the East, Obama will be declared the winner. You all will be in bed by the late news. Looks like a lot of fun! I would love to fast-forward two weeks. I'm so anxious for the suspense to be over.